Have you thought about how you’ll maintain your vehicle this spring? If you haven’t, you’ll need to soon. A well-maintained vehicle lasts years longer than one that has been neglected. Check all fluids. You’ll want to make sure that you have enough oil, transmission fluid, windshield wiper fluid, and antifreeze/coolant for your car to operate optimally. Check hoses to make sure that none have come loose. 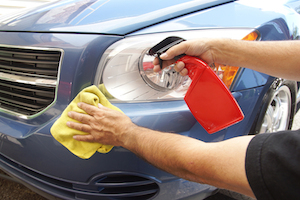 This car care tip can keep you out of the auto shop and away from a costly repair. Check the brakes. You don’t want to be in an accident because your brakes failed you, right? This car care tip is one of the most important one you’ll find as a vehicle owner. Inspect the exhaust system. Carbon monoxide poisoning is terrifying. A well working exhaust system is worth its weight in gold. Car care is something that generates an expense that is unavoidable. Have the HVAC system examined. You’ll need your heater and air conditioner more than you ever thought you would. This is one area of car care that can’t be ignored. Check the tires. Use your tire gauge and check the tread using a penny. Have your tires rotated and replace them when you notice them going bald or flat. A car care kit should have one of these tools in it. Check the wipers. Your windshield wipers help remove debris and dirt from your windshield. They also make it possible to see in rain, sleet, and snow. Schedule a tune-up. Part of routine car care involves having a mechanic take a look at your vehicle. This will ensure that your engine is purring and that you’ll be able to get to and from your destination safely and without the assistance of a tow truck. Car care should be at the top of your priorities. By properly maintaining your vehicle, it will run better and last longer. Who wants to spend money on a car only to find out that you’ll need to buy a new one right away? A little car care goes a long way. At Sallas Auto Repair, we want to make sure your car is in tip-top shape after the crazy weather we’ve been having during winter. Visit us for air conditioning repair, fuel filter replacement and many more auto repair services. Also, please check out our oil change coupons! Call us today to get your spring tune-up!